The new Mean Dynamic Topography for the Mediterranean Sea (SMDT-MED-2014) has been produced as a combined effort by SOCIB, CLS, OGS and IMEDEA (CSIC-UIB). numerical model output provided by INGV. The SMDT-MED-2014 is of significant scientific interest since semi-enclosed Seas such as the Mediterranean, are characterized by smaller spatial scales than in the open ocean, and thus represent challenging regions for the use of altimetry data. 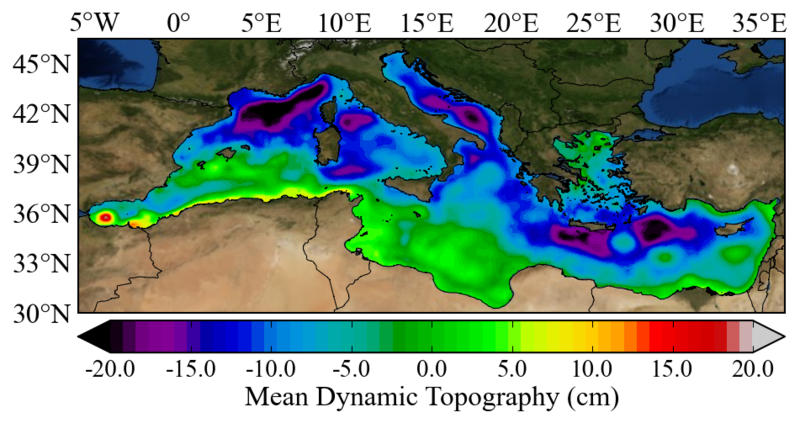 More specifically, this new MDT provides an improved description of the main currents and semi-permanent structures of the Mediterranean Sea, with an improved description of major currents as the Liguro-Provençal Current, or known structures as the Bonifacio gyre, compared to the previous SMDT07 solution. This new MDT therefore constitutes an essential tool to characterise the state and variability of the Mediterranean Sea from Sea-Level Anomaly (SLA) data. It will also improve the assimilation of SLA into operational forecasting systems in the Mediterranean.